On November 9, the Student Counseling Center invited Kim Kwang-ho, who has directed a variety of documentaries of Korea Educational Broadcasting System (EBS) such as 60 Minutes Parents, Mother Shock, The Age of Emotions, to deliver a special lecture on emotional well-beings at the International Studies Hall of Korea University (KU). 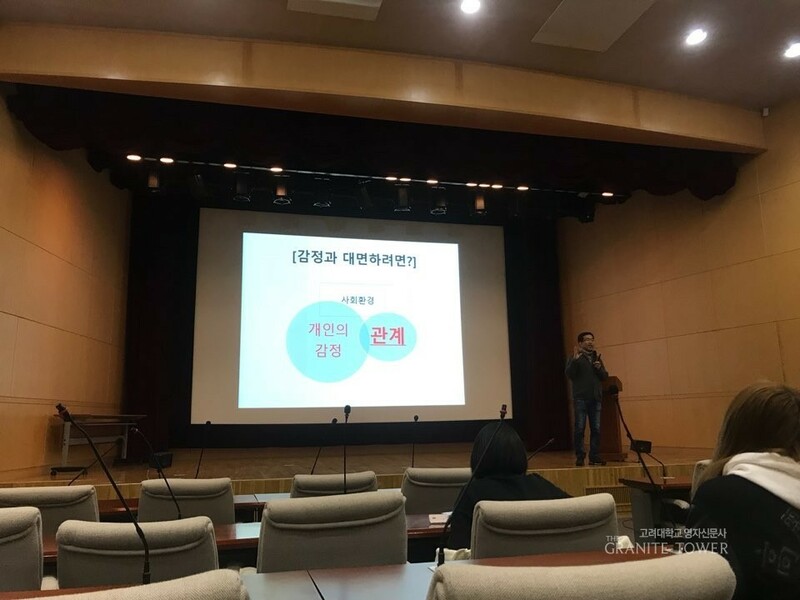 The lecture centered on what Kim gained from his personal experiences working as a producer (PD) of numerous series that dealt with issues regarding feelings. The main point he emphasized throughout the lecture was that one’s sentiment does not stem only from the personal aspects. He stated it is a combined result of one’s personal aspect, social environment, and relationships. The lecturer further explained that external factors in one’s social environment causes distorted and exaggerated negative emotions such as fear and unrest, highlighting the importance of not confusing such fake feelings as one’s own. The lecture ended with an insightful message that, “emotions are the standards of a society and its barometers,” highlighting the importance of sentiments and their reflection of the society. Through this lecture, students were able to develop more comprehensive views on emotions and a better understanding on the reason behind the negative feelings. The Student Counseling Center is expected to continue to provide such programs that feature topics about mental health.